Iconic supergroup Guns N’ Roses have added another New York appearance this week with a performance at Brooklyn Bowl in Williamsburg, Brooklyn this Thursday, June 6th (doors: 8pm ET). The full-set will be followed by a late night after-party featuring GN’R keyboardist Chris Pitman as DJ. Presented by Brooklyn Bowl and Governors Ball, tickets for the 21-and-up event go on sale to the general public today, June 4th, at 7pm ET. Click here to order tickets. Guns N’ Roses are set to headline Governors Ball this Saturday, June 8th as well as perform at Buffalo Outer Harbor Fest on Wednesday, June 5th. 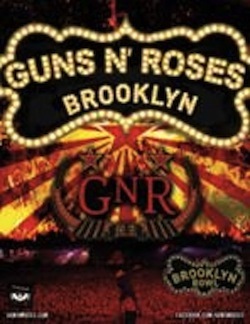 For more information on their schedule, visit www.gunsnroses.com. The Brooklyn Bowl show is the continuation in a series of intimate performances over the past year including the Hiro Ballroom, their historic return to The Ritz (now Webster Hall), The Electric Factory in Philly, and House of Blues in various cities including L.A., Chicago, Houston and Dallas. Celebrated worldwide as one of the most important rock acts in music history, Guns N’ Roses are Axl Rose, DJ Ashba (guitar), Dizzy Reed (keyboards), Tommy Stinson (bass), Richard Fortus (guitar), Ron “Bumblefoot” Thal (guitar), Chris Pitman (keyboards) and Frank Ferrer (drums). Guns N’ Roses continue on their sold-out global arena tour, with shows in the U.S., Europe, visits to Latin America and multiple festivals, having played to millions of fans around the globe. Let the original members tour as G&R with Miles Kennedy singing and give Axl a taste of his own medicine. He downplays the contributions of those original members by simply plugging in other guys and carries on under the G&R banner. If he toured as Axl Rose, I wonder how many tickets he would sell? Axl and his current band ar great. They put on a great show. He is Guns n Roses. Every true GNR fan will tell you they only wanna hear their hits if Axl is singing them. Listenign to Miles Kennedy sing Welcome to the Jungle and Paradis City is painful and pathetic. Hey Axl, why don’t you go sell out another Peruvian soccer stadium and quit playing the States? At this point I’d just be happy if Velvet Revolver got back together. How many people does it take to play in a band? Absolutely rediculous and insulting to GNR fans. I have nothing bad to say about the musicians that are in the current GNR lineup–it’s not their fault, in fact I applaud them for jumping at the opportunity to play with Axl and for the chance to be a part of the GNR family. These guys can play every tune NOTE FOR NOTE PITCH PERFECT–and that’s somewhat of the issue. These guys didn’t live through the grime/slime and sleeze of the LA street life. There’s no feeling when they are playing tunes that were written by the guys who lived it. I completely blame Axl for dragging the GNR name through the mud–yes, I’ve read Slash’s book and understand why Axl had the rights to the GNR name…I don’t agree with it at all. Anyone who pays to see this lineup play should be given a refund or have their head examined.